TROLAK, PERAK, 7 June 2014 – School children should be brave enough to enter the science and technology stream (STEM) as they are the country’s hope for the future to create an innovation-driven economy. 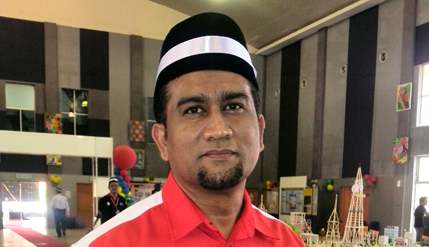 Senior Lecturer at the Faculty of Education of The National University of Malaysia (UKM) Dr Mohammad Sattar Rasul said the school children need only to respond to the government’s offer as all the necessary infrastructure is being provided for them. Dr Sattar said this to the UKM News Portal after the launching of the inaugural Bitara STEM UKM-FELDA, a special programme for children of FELDA settlers aged 13 to 15 years to inculcate interest in science and technology among them. The programme held from 6 to 10 June at the MARA Junior Science College (MRSM) here exposed the students to learning experiences in which they are mentored to develop tools for urban infrastructure required for an Intelligent Community. Dr Sattar, the coordinator of the programme, said UKM itself is proof to the participants of the potential of successful Malays in Science, Technology, Engineering and Mathematics (STEM). He said a total of 70 students from UKM helped as facilitators while 20 lecturers act as mentors to the students drawn from all FELDA schemes. The students when creating the Intelligent Community, not only plan how to use the latest energy systems but are exposed to the need to be creative and innovative in the planning of transport and urban infrastructure that is flexible, futuristic and customised according to the needs and specifications of the public. A network of smart environments would be developed equipped with communications using wireless networks. The Bitara STEM programme is an initiative under the Global Science and Innovation Advisory Council (GSIAC) chaired by Prime Minister Datuk Seri Najib Tun Razak. The programme is a collaboration between the Ministry of Education, Malaysian Industry Government Group for High Technology (MIGHT), the New York Academy of Sciences (NYAS) and the Polytechnic Institute of New York University (NYU-Poly). It is one of the GSIAC’s High Impact Programme of Human Capacity Building and Cradle to Career (C2C) plan. To achieve the C2C agenda, a Memorandum of Agreement had been signed in September 2013 between UKM, the New York Academy of Sciences (NYAS) and the Polytechnic Institute of New York University (NYU-Poly). The objective is to use human resources to create a class of technocrats in line with national initiatives. It is hoped to inspire and arouse the interest of a new generation of students to learn STEM through a student-centered approach, project-based learning, multi-disciplinary activities and learning through inquiry. It provides an environment where learning is fun and reduces anxiety for STEM thus removing the fear of STEM among students while increasing the skills of science processes, higher order thinking and research skills of students.